We've all been there. A turn of the key and instead of that expected comforting sound of the starter turning and the engine firing up, we hear GRR...GRR...GRR and then nothing; or a single click, or a series of fast clicks...or nothing at all. This post will cover what each of these sounds means and how to troubleshoot the problem and get that vehicle running again. The starting equipment on any vehicle has two prime components, working together to turn the engine over: the battery and the starter. The majority of starting problems will be caused one of these two. The third potential trouble source is the control system consisting of relays, fuses, switches and wiring. We'll cover all three of these in order of frequency of failure. The battery is the number one suspect and must be cleared before looking at any other cause. However, there are a number of symptoms, both auditory and visual that might cause confusion with other causes. Here are several situations that can arise from battery trouble. 1) Partial discharge. When the starter turns but only slowly and makes a groaning sound and can't start the car, think battery. 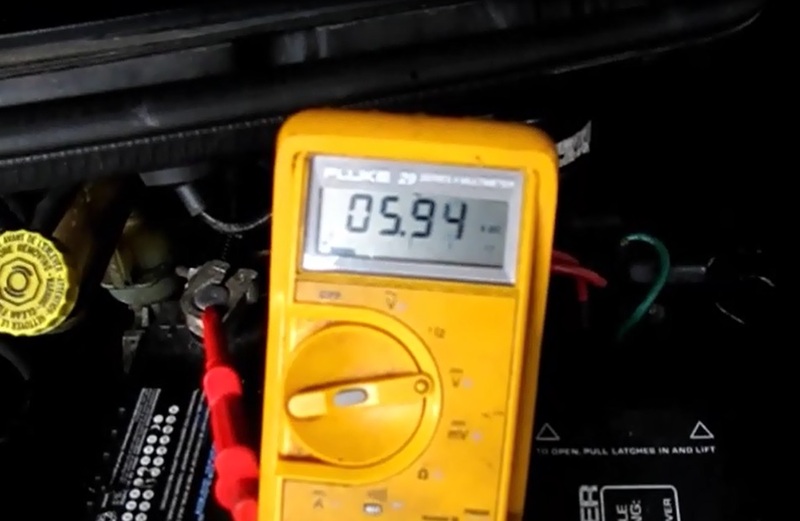 This happens when the battery is partially discharged, with voltages in the low 11s. The headlights may still work, but possibly are bit weaker. 2) Further discharge. With even more discharge at around 11V and into the lower 10s, there is only enough power to energize the solenoid coil and throw the plunger and pinion gear out, but not enough to supply the much higher demand of the powerful starter motor. 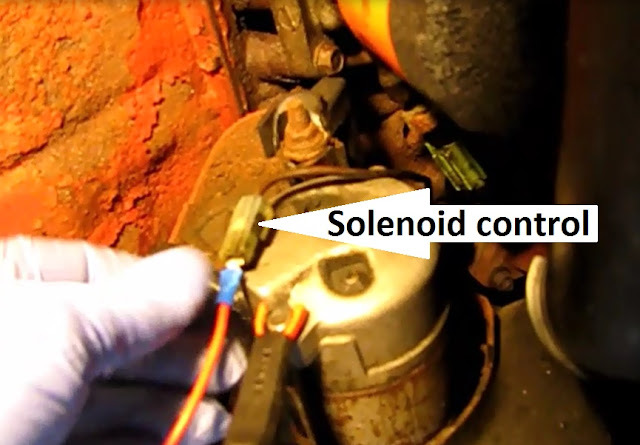 You may hear the rat-a-tat-tat of the solenoid going out and back in repeatedly as the starter windings pull down the battery enough to de-energize the solenoid in a cycle that repeats itself several times a second. 3) Complete discharge. There is not a peep coming from the starter as the key is turned into the start position. The battery is stone dead and the there are no headlights or interior lights or sounds. The battery voltage will be in the single digits. A digital voltmeter is good to have here, although the sounds and sights described above are good troubleshooting aids. The ultimate confirmation is to sub in a known good battery...jump-start the vehicle. It's always a good practice to try jump starting first before buying a new battery. Also check the battery connections. A loose or corroded connection can cause enough voltage drop to result in the battery being unable to provide the needed power to the starter. The starter motor is itself composed of three components. First there is the solenoid, an electro-magnet and plunger that pushes a pinion gear outward into position to engage the flywheel. There is also a switch that closes at the end of plunger travel and sends the battery plus (B+) to the starter motor windings. Finally there is the powerful little DC motor that does the heavy lifting and turns the engine to get it going. 1) There will be a single click as the key is turned into the start position. There is no sound of a motor turning. The headlights and interior lights are strong. The battery checks out. Even a jump will have no effect. The click signals that the starter is getting a start signal which confirms that the rest of the start control circuit is working. This is an indication that the starter motor windings are most likely open. To confirm, check for the battery voltage at the large stud on the starter with a voltmeter or test light. It is highly unlikely that this large wire would be open or disconnected but a quick check will reveal if it's ok. If the B+ is there replace the starter. 2) There is not a sound coming from the starter, although the battery is strong. If there is no sound coming from the starter, it is important to confirm that the starter is getting a start signal at the solenoid. This test is vital to avoid replacing a good starter. 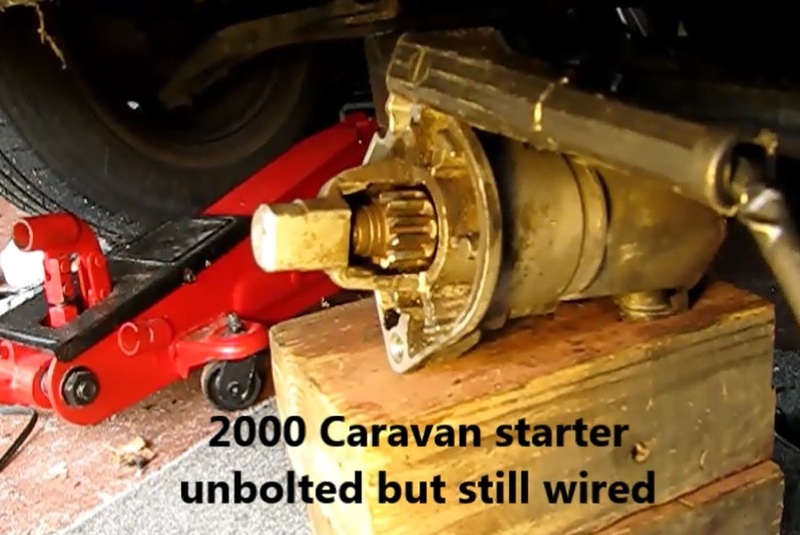 To do this either unbolt the start wire or unplug it. Unless it's a pick-up truck. it may be necessary to raise the vehicle up for access. Then put a DC voltmeter or trouble light at the end of the wire and monitor while a helper turns the key into the start position. On some vehicles there is no way to get at the wires with the starter mounted in the car. It will be necessary to unbolt it and move it into position to be tested. Disconnect the battery before attempting this or otherwise the live 12 B+ voltage might be accidently grounded as the starter is handled. When attempting to do the solenoid signal test the starter will have to be grounded to complete the circuit. Unbolting it removed the ground. Use a jumper cable, but the best way is to bolt a wire onto a starter bolt hole. Get a meter or test light on the end of the solenoid control wire. Dodge Caravan shown. If the 12V start signal is getting to the solenoid it means one of two things: 1) The solenoid plunger is stuck or 2) the solenoid coil is open electrically. To check if it is stuck, tap on it with a hammer while a helper turns the ignition to start. If the car now starts, the solenoid part of the starter is bad. This part can often be replaced without changing the entire starter and at considerably less expense. If tapping on it won't get it started, the entire starter should be replaced. One other far more rare possibility should also be mentioned. A seized engine could look much like a bad starter. If the starter is humming or buzzing with no engine movement it would be a good idea to try to turn the crank shaft with a socket and breaker bar. Disconnect the battery before trying this. If the 12V signal is not getting to the starter, the problem is elsewhere. Do not replace the starter. A few things can be checked first, but after they are cleared, an electrical schematic of the start circuit may be needed. 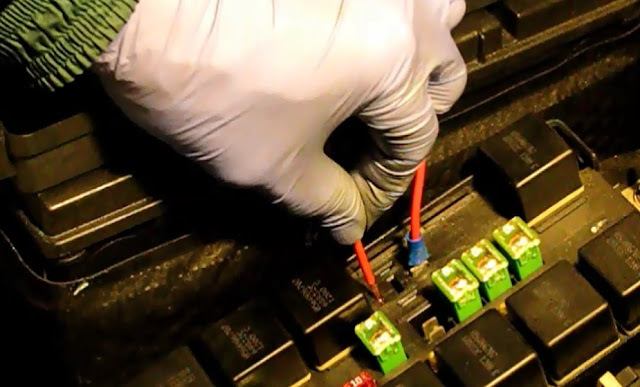 In order of likelihood of failure and considering ease of locating and checking, these are 1) the starter relay, fuses, and the wire from the relay to the solenoid. The trouble is less likely to come from the neutral safety switch, the ignition switch and the wiring between them. 1) Check the starter relay. Most cars and trucks have a starter relay. This component switches a low current control voltage over to a high current power circuit that can energize the starter solenoid. It is usually located in a fuse and relay box under the hood, although it sometimes stands alone in the firewall or elsewhere. It may take a schematic or repair manual to find. The components of a generic start circuit. The best way to troubleshoot the relay is to sub in another one. Your car may already have more than one of the exact same relays doing some other job, sometimes right beside it. Then it's just a matter of unplugging the starter relay and putting a known working one in it's place and trying to start the car. If it goes, a new relay is needed. Another thing you can do is put a finger on the cube style relay while a helper turns the keys. 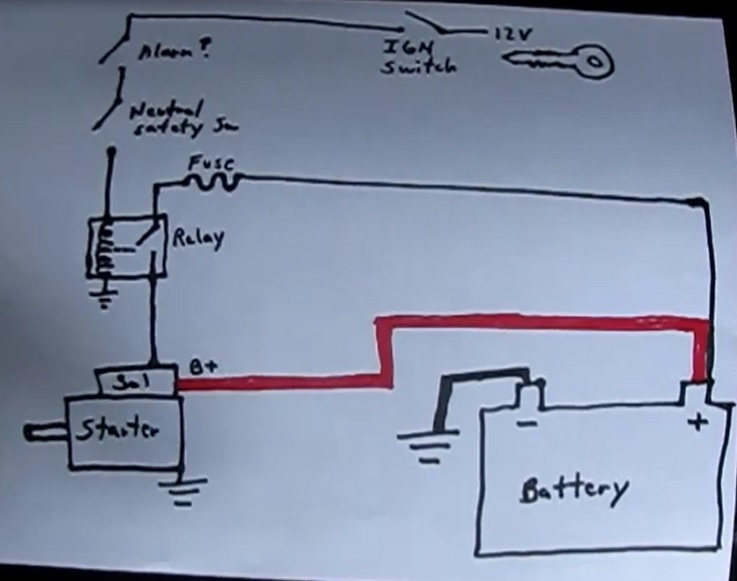 If you feel and hear a click this is confirmation that the signal is coming through the rest of the circuit and getting to the relay. The power side of this circuit may have a problem. 2) Check the fuses. There are often two fuses in a start circuit. One is in the control circuit, protecting the wiring and components up to the starter relay coil input. The other is in the power circuit protecting the wiring and solenoid. Find and check these early on in trouble shooting. 3) Check the wiring between the starter relay and the solenoid. This check will also be a live check for the power fuse. This involves finding the two power contacts on the starter relay and touching a jumper between them. If the starter turns this confirms that the wiring is good from the relay output to the solenoid. This component is mounted on the transmission and and allows starting the engine only in neutral or park and protects against starting the engine in any other gear. If you suspect the neutral safety switch it will necessary to sub in a new one or jump around it. I once had a no crank issue when this switch came unplugged. If the ignition switch is suspect it will be necessary to remove it from the steering column and test or sub in another. Usually the steering column cover will have to be removed to get at the switch. If your car has an anti- theft system and this is the suspect in a fail to start, a dealer service department will likely be required to fix it. Wiring issues can be the toughest to resolve. I once had a car that wouldn't start from the ignition switch and I had to jump across the power side of the starter relay, mounted on the firewall, to start the car. So I would pop the hood and put the blade of a screwdriver across the contacts. Somewhere between the ignition switch and the relay a wire was open. We had to find the open wire and splice a good piece between the switch and the relay. In general with wiring issues, use an ohmmeter to find the open section of wire or install a fused test jumper to test it live. Vehicle problems are quite common and it arises due to lack of proper repair and maintenance, so we definitely need to know certain facts through which we can easily maintain the vehicle in a very good condition. Mostly we are facing problems like starting problems, battery problems, spark plug problems, and many other types. So, whenever our car won't crank or start, we should go for professional from a certified repair and service center. Very good info I hope this is the problem. This is a great list! I think everyone needs to know this kind of stuff. I've been looking for some free repair manuals. I hope I can find a good one.